Your face is the mirror that reflects your personality, it’s the first thing people notice when they meet you. A face covered with sagging skin and wrinkles is not an accurate reflection of who you are. Today we will be giving you some remedies, mostly natural and homemade, that can help you in get rid of wrinkles and sagging skin. Egg whites are a great source of protein, and also a natural astringent which is helpful for getting rid of sagging skin. Take two egg whites and whisk until foamy, apply to your face and leave on for 20 minutes. Rinse with water for an instant skin lift. For those who do not want to use eggs, tomatoes are a good alternative. 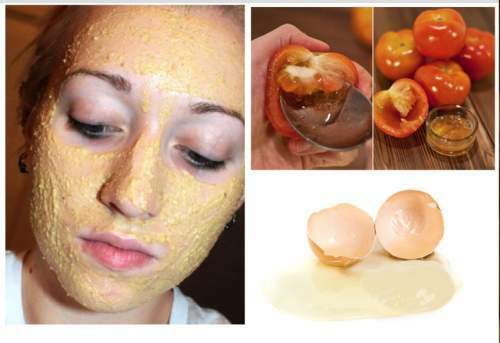 Remove the juice from a tomato and apply it to your skin in a circular motion. Massage it in for 5 minutes then leave it on for an hour. Wash off with cold water for gentle tightening effects. Since tomatoes contain acid it might irritate your skin, do not use this if you are allergic to tomatoes. Olive oil is effective at giving your skin firmness while lemon juice is known for lightening it. This super combo may do the trick for you. Take 1 teaspoon olive oil and mix it with one-half teaspoon lemon juice, apply to your face and leave for 15 minutes. Wash with lukewarm water and you are good to go. It should be no surprise that well hydrated skin just looks better, it’s the simplest beauty trick, other than a genuine smile. In addition to numerous health benefits, drinking 10-12 glasses of water every day can help you maintain firm, fabulous skin with little effort. Studies show that cucumber has rejuvenating effects on skin. A cucumber facemask can easily be made by mixing two Tablespoons cucumber juice with 5 drops of vitamin E oil. You can add an egg white for extra firming if you desire. Apply to your face and leave on for 15 minutes, wash it off with cool water. Repeating weekly will reap great results. Almond oil is a rich source of vitamin E, it’s a fantastic moisturizing agent and is well-known for its skin beautifying properties. You can apply almond oil daily to your face, your skin absorbs it and moisturizes pores and cells which helps prevent sagging. Honey can be a terrific moisturizer, and its anti-aging characteristics make it a skin essential. Mix 3 tablespoons honey with 6-10 drops of olive oil and lemon, apply the mixture to your face and neck and leave on for 15 minutes before washing it off with warm water. Do this every day for best results. Use common sense with these remedies and tips and do not use if you are allergic to any of the ingredients. If you are allergic to bee stings make sure you can use honey safely. Enjoy your more radiant skin with a big smile!